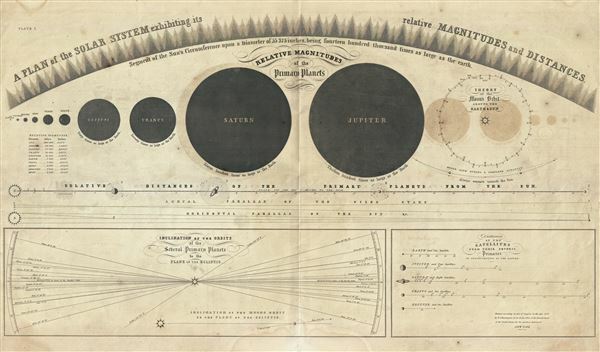 This rare 1856 map or chart by Elijah Burritt illustrates the plan of the Solar System and the relative magnitude and distances of the primary planets. It shows the primary planets in relation to one another both with regard to magnitude and distance from the sun. The chart includes two sub charts detailing the inclination of the orbits of the several primary planets to the plane of the Ecliptic and the distances of the satellites from their several primaries. This map was issued as plate no. I in the Mason Brother's 1856 edition of Atlas, Designed to Illustrate Burritt's Geography of the Heavens. Very good. Minor wear along original centerfold. Overall age toning and some spotting here and there. Some offsetting. Lower margin exhibits minor damp stains near centerfold. Rumsey 2853.001 (1835 edition). Kidwell, Peggy Aldrich, Elijah Burritt and the 'Geography of the Heavens. ', Sky & Telescope 69 (Jan 1985).